Patients in whom the clinical severity of the disease lies between that of thalassemia major and thalassemia minor are categorized as having thalassemia intermedia. Several different genotypes are associated with thalassemia intermedia. Hemoglobin (Hb) E, a common Hb variant found in Southeast Asia, is associated with a beta thalassemia phenotype, and this variant is included in the beta thalassemia category of diseases. Patients with thalassemia minor usually do not require any specific treatment. Treatment for patients with thalassemia major includes long-term transfusion therapy, iron chelation, splenectomy, allogeneic hematopoietic transplantation, and supportive measures. See Treatment. 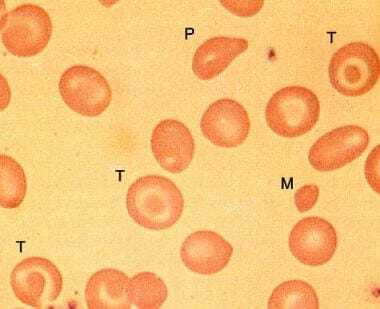 Peripheral smear in beta-zero thalassemia minor showing microcytes (M), target cells (T), and poikilocytes. Peripheral smear in beta-zero thalassemia minor showing microcytes (M), target cells (T), and poikilocytes.The genetic defect usually is a missense or nonsense mutation in the beta-globin gene, although occasional defects due to gene deletions of the beta-globin gene and surrounding regions also have been reported. In beta thalassemia minor (ie, beta thalassemia trait or heterozygous carrier-type), one of the beta-globin genes is defective, resulting in an approximately 50% decrease in the synthesis of the beta-globin protein. 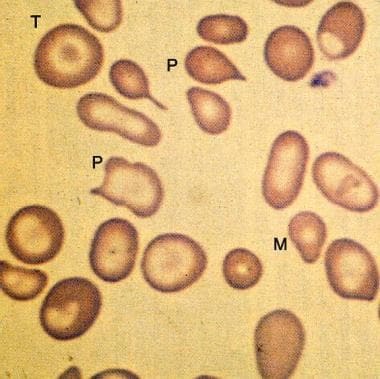 Peripheral smear from a patient with beta-zero thalassemia major showing more marked microcytosis (M) and anisopoikilocytosis (P) than in thalassemia minor. Target cells (T) and hypochromia are prominent. Peripheral smear from a patient with beta-zero thalassemia major showing more marked microcytosis (M) and anisopoikilocytosis (P) than in thalassemia minor. Target cells (T) and hypochromia are prominent. The excess unpaired alpha-globin chains aggregate to form precipitates that damage red cell membranes, resulting in intravascular hemolysis. Premature destruction of erythroid precursors results in intramedullary death and ineffective erythropoiesis. The profound anemia typically is associated with erythroid hyperplasia and extramedullary hematopoiesis. Although beta thalassemia is caused by a genetic mutation in the beta-globin gene (which is located on chromosome 11), many additional factors influence the clinical manifestations of the disease. That is, the same mutations may have different clinical manifestations in different patients. The factors below are known to influence the clinical phenotype. The level of expression of fetal Hb (ie, the expression level of the gamma-globin gene) in red blood cells determines, in part, the severity of the disease. Patients with high fetal Hb have milder disease. Patients with coinheritance of alpha thalassemia have a milder clinical course because they have a less severe alpha-beta chain imbalance. The coexistence of sickle cell trait and beta thalassemia is a major and symptomatic hemoglobinopathy with most of the symptoms and complications of sickle cell disease. Unlike sickle cell trait, in which most Hb-on-Hb electrophoresis is Hb A (AS), S is the dominant Hb (SA) and usually constitutes about 60% or more of the circulating Hb, depending on the transfusion status of the patient and the nature of the coexisting beta-thalassemia mutation (ie, beta-zero vs beta-plus). The frequency of beta thalassemia varies widely, depending on the ethnic population. The disease is reported most commonly in Mediterranean, African, and Southeast Asian populations. The disease is found most commonly in the Mediterranean region, Africa, and Southeast Asia, presumably as an adaptive association to endemic malaria. The prevalence may be as high as 10% in these areas. Beta thalassemia genes are reported throughout the world, although more frequently in Mediterranean, African, and Southeast Asian populations. Patients of Mediterranean extraction are more likely than Africans to be anemic with thalassemia trait, because they tend to have beta-zero thalassemia rather than beta-plus thalassemia. The genetic defect in Mediterranean populations is caused most commonly by either (1) a mutation creating an abnormal splicing site or (2) a mutation creating a premature translation termination codon. Southeast Asian populations also have a significant prevalence of Hb E and alpha thalassemia. African populations more commonly have genetic defects leading to alpha thalassemia. The manifestations of the disease may not be apparent until a complete switch from fetal to adult Hb synthesis occurs. This switch typically is completed by the sixth month after birth. Individuals with thalassemia minor (thalassemia trait) usually have mild, asymptomatic microcytic anemia. This state does not result in mortality or significant morbidity. The prognosis of patients with thalassemia major is highly dependent on the patient's adherence to long-term treatment programs, namely the hypertransfusion program and lifelong iron chelation. Allogeneic bone marrow transplantation may be curative. The major causes of morbidity and mortality in beta thalassemia are anemia and iron overload. The severe anemia resulting from this disease, if untreated, can result in high-output cardiac failure; the intramedullary erythroid expansion may result in associated skeletal changes such as cortical bone thinning. The long-term increase in red-cell turnover causes hyperbilirubinemia and bilirubin-containing gallstones. Increased iron deposition resulting from lifelong transfusions and enhanced iron absorption results in secondary iron overload. This overload causes clinical problems similar to those observed with primary hemochromatosis (eg, endocrine dysfunction, liver dysfunction, cardiac dysfunction). Educate patients with thalassemia minor about the genetic (hereditary) nature of their disease, and inform them that their immediate family members (ie, parents, siblings, children) may be affected. The presence of beta-thalassemia minor in both parents implies that there is about a one fourth chance that a child will have thalassemia major. Careful genetic counseling is also appropriate for patients in whom one parent has beta-thalassemia minor and the other parent has some form of beta-globin–related disease, such as sickle cell carriage. Inform patients with thalassemia minor that they do not have iron deficiency and that iron supplementation will not improve their anemia. Siri-Angkul N, Chattipakorn SC, Chattipakorn N. Diagnosis and treatment of cardiac iron overload in transfusion-dependent thalassemia patients. Expert Rev Hematol. 2018 Jun. 11 (6):471-479. [Medline]. Needs T, Lynch DT. Beta Thalassemia. 2018 Jan. [Medline]. [Full Text]. Rachmilewitz EA, Giardina PJ. How I treat thalassemia. Blood. 2011 Sep 29. 118(13):3479-88. [Medline]. Galanello R, Sanna S, Perseu L, Sollaino MC, Satta S, Lai ME, et al. Amelioration of Sardinian beta0 thalassemia by genetic modifiers. Blood. 2009 Oct 29. 114(18):3935-7. [Medline]. [Full Text]. Nemtsas P, Arnaoutoglou M, Perifanis V, Koutsouraki E, Orologas A. Neurological complications of beta-thalassemia. Ann Hematol. 2015 Aug. 94 (8):1261-5. [Medline]. Helmi N, Bashir M, Shireen A, Ahmed IM. Thalassemia review: features, dental considerations and management. Electron Physician. 2017 Mar. 9 (3):4003-4008. [Medline]. [Full Text]. Nomani H, Bayat G, Sahebkar A, Fazelifar AF, Vakilian F, Jomezade V, et al. Atrial fibrillation in β-thalassemia patients with a focus on the role of iron-overload and oxidative stress: A review. J Cell Physiol. 2018 Dec 10. [Medline]. Amid A, Haghi-Ashtiani B, Kirby-Allen M, Haghi-Ashtiani MT. Screening for thalassemia carriers in populations with a high rate of iron deficiency: revisiting the applicability of the Mentzer Index and the effect of iron deficiency on Hb A2 levels. Hemoglobin. 2015. 39 (2):141-3. [Medline]. Basu S, Kumar A. Hair-on-end appearance in radiograph of skull and facial bones in a case of beta thalassaemia. Br J Haematol. 2009 Mar. 144 (6):807. [Medline]. [Full Text]. Pennell DJ, Udelson JE, Arai AE, Bozkurt B, Cohen AR, Galanello R. Cardiovascular function and treatment in ß-thalassemia major: a consensus statement from the American Heart Association. Circulation. 2013 Jul 16. 128(3):281-308. [Medline]. Jacob HS, Winterhalter KH. The role of hemoglobin heme loss in Heinz body formation: studies with a partially heme-deficient hemoglobin and with genetically unstable hemoglobins. J Clin Invest. 1970 Nov. 49 (11):2008-16. [Medline]. [Full Text]. Hapgood G, Walsh T, Cukierman R, Paul E, Cheng K, Bowden DK. Erythropoiesis is not equally suppressed in transfused males and females with β-thalassemia major: are there clinical implications?. Haematologica. 2015 Aug. 100 (8):e292-4. [Medline]. [Full Text]. Thomas ED, Buckner CD, Sanders JE, Papayannopoulou T, Borgna-Pignatti C, De Stefano P. Marrow transplantation for thalassaemia. Lancet. 1982 Jul 31. 2(8292):227-9. [Medline]. Lucarelli G, Galimberti M, Polchi P. Marrow transplantation in patients with thalassemia responsive to iron chelation therapy. N Engl J Med. 1993 Sep 16. 329(12):840-4. [Medline]. [Full Text]. Elalfy MS, Saber MM, Adly AA, Ismail EA, Tarif M, Ibrahim F, et al. Role of vitamin C as an adjuvant therapy to different iron chelators in young β-thalassemia major patients: efficacy and safety in relation to tissue iron overload. Eur J Haematol. 2015 May 28. [Medline]. Ferrari G, Cavazzana M, Mavilio F. Gene Therapy Approaches to Hemoglobinopathies. Hematol Oncol Clin North Am. 2017 Oct. 31 (5):835-852. [Medline]. Lidonnici MR, Paleari Y, Tiboni F, Mandelli G, Rossi C, Vezzoli M, et al. Multiple Integrated Non-clinical Studies Predict the Safety of Lentivirus-Mediated Gene Therapy for β-Thalassemia. Mol Ther Methods Clin Dev. 2018 Dec 14. 11:9-28. [Medline]. [Full Text]. Gene Therapy for Transfusion Dependent Beta-thalassemia (TIGET-BTHAL). ClinicalTrials.gov. Available at https://clinicaltrials.gov/ct2/show/NCT02453477. June 7, 2017; Accessed: November 28, 2017. A Study Evaluating the Efficacy and Safety of the LentiGlobin® BB305 Drug Product in Subjects With Transfusion-Dependent β-Thalassemia. ClinicalTrials.gov. Available at https://clinicaltrials.gov/ct2/show/NCT02906202. April 10, 2017; Accessed: November 28, 2017. Rivella S. β-thalassemias: paradigmatic diseases for scientific discoveries and development of innovative therapies. Haematologica. 2015 Apr. 100 (4):418-30. [Medline]. [Full Text]. Italia KY, Jijina FJ, Merchant R, et al. Response to hydroxyurea in beta thalassemia major and intermedia: experience in western India. Clin Chim Acta. 2009 Sep. 407(1-2):10-5. [Medline]. Wilber A, Nienhuis AW, Persons DA. Transcriptional regulation of fetal to adult hemoglobin switching: new therapeutic opportunities. Blood. 2011 Apr 14. 117(15):3945-53. [Medline]. [Full Text]. Raechel P et al, 55th Annual ASH Meeting abstracts, 2013, abstract # 1022. Perrine SP, Pace BS, Faller DV. Targeted fetal hemoglobin induction for treatment of beta hemoglobinopathies. Hematol Oncol Clin North Am. 2014 Apr. 28(2):233-48. [Medline]. Dulmovits BM, Appiah-Kubi AO, Papoin J, Hale J, He M, Al-Abed Y, et al. Pomalidomide reverses γ-globin silencing through the transcriptional reprogramming of adult hematopoietic progenitors. Blood. 2016 Mar 17. 127 (11):1481-92. [Medline]. Maria-Domenica C, 55th Annual ASH Meeting abstracts, 2013, abstract # 3448. Fibach E, Rachmilewitz EA. Does erythropoietin have a role in the treatment of ß-hemoglobinopathies?. Hematol Oncol Clin North Am. 2014 Apr. 28(2):249-63. [Medline]. Cavazzana-Calvo M, Payen E, Negre O, et al. Transfusion independence and HMGA2 activation after gene therapy of human ß-thalassaemia. Nature. 2010 Sep 16. 467(7313):318-22. [Medline]. Ganz T. Hepcidin and iron regulation, 10 years later. Blood. 2011 Apr 28. 117(17):4425-33. [Medline]. [Full Text]. Liu J, Sun B, Yin H, Liu S. Hepcidin: A Promising Therapeutic Target for Iron Disorders: A Systematic Review. Medicine (Baltimore). 2016 Apr. 95 (14):e3150. [Medline]. [Full Text]. Casale M, Filosa A, Ragozzino A, Amendola G, Roberti D, Tartaglione I, et al. Long-term improvement in cardiac magnetic resonance in β-thalassemia major patients treated with deferasirox extends to patients with abnormal baseline cardiac function. Am J Hematol. 2018 Nov 29. 87(7):732-3. [Medline]. Cassinerio E, Roghi A, Pedrotti P, Brevi F, Zanaboni L, Graziadei G, et al. Cardiac iron removal and functional cardiac improvement by different iron chelation regimens in thalassemia major patients. Ann Hematol. 2012 May 10. [Medline]. Bollig C, Schell LK, Rücker G, Allert R, Motschall E, Niemeyer CM, et al. Deferasirox for managing iron overload in people with thalassaemia. Cochrane Database Syst Rev. 2017 Aug 15. 8:CD007476. [Medline]. Pennell DJ, Porter JB, Piga A, Lai Y, El-Beshlawy A, Belhoul KM, et al. A 1-year randomized controlled trial of deferasirox vs deferoxamine for myocardial iron removal in ß-thalassemia major (CORDELIA). Blood. 2014 Mar 6. 123(10):1447-54. [Medline]. [Full Text]. Belmont A, Kwiatkowski JL. Deferiprone for the treatment of transfusional iron overload in thalassemia. Expert Rev Hematol. 2017 Jun. 10 (6):493-503. [Medline]. Tricta F, Uetrecht J, Galanello R, Connelly J, Rozova A, Spino M, et al. Deferiprone-induced agranulocytosis: 20 years of clinical observations. Am J Hematol. 2016 Oct. 91 (10):1026-31. [Medline]. [Full Text]. Poggi M, Sorrentino F, Pugliese P, Smacchia MP, Daniele C, Equitani F, et al. Longitudinal changes of endocrine and bone disease in adults with β-thalassemia major receiving different iron chelators over 5 years. Ann Hematol. 2016 Apr. 95 (5):757-63. [Medline]. Elalfy MS, Adly AM, Wali Y, Tony S, Samir A, Elhenawy YI. Efficacy and safety of a novel combination of two oral chelators deferasirox/deferiprone over deferoxamine/deferiprone in severely iron overloaded young beta thalassemia major patients. Eur J Haematol. 2015 Nov. 95 (5):411-20. [Medline]. Olivieri NF, Brittenham GM, McLaren CE, et al. Long-term safety and effectiveness of iron-chelation therapy with deferiprone for thalassemia major. N Engl J Med. 1998 Aug 13. 339(7):417-23. [Medline]. [Full Text]. [Guideline] Angelucci E, Barosi G, Camaschella C, et al. Italian Society of Hematology practice guidelines for the management of iron overload in thalassemia major and related disorders. Haematologica. 2008 May. 93(5):741-52. [Medline]. Elalfy MS, Adly A, Awad H, Tarif Salam M, Berdoukas V, Tricta F. Safety and efficacy of early start of iron chelation therapy with deferiprone in young children newly diagnosed with transfusion-dependent thalassemia: A randomized controlled trial. Am J Hematol. 2017 Nov 9. [Medline].